Fact check: Obama said he would 'spread his wealth around'? Republican presidential nominee Sen. John McCain, during a speech on October 16 outside Philadelphia, recounted the story of "Joe the Plumber," a man who held a conversation with Democratic candidate Sen. Barack Obama and who became the surprise star of the candidates' October 15 debate when McCain gave an account of the story. McCain said the man told Obama, "'Look, I've been working all my life - 10, 12 hours. I want to buy the business I'm in, but you're going to raise my taxes.' And you know what Senator Obama had to say to Joe? He wanted to spread his wealth around. He wanted to spread his wealth around." 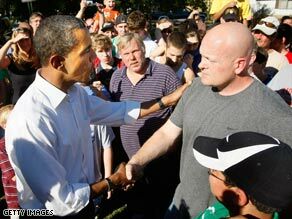 Sen. Obama had been campaigning outside Toledo, Ohio, on October 12 when he met Joe Wurzelbacher, 34, who works for Newell Plumbing & Heating Co., a small firm in the Toledo area. "I'm getting ready to buy a company that makes $250-270-80 thousand a year," Wurzelbacher said. "Your new tax plan is going to tax m more, isn't it?" Obama explained his tax plan during the roughly five-minute exchange - telling Wurzelbacher that the tax rate on the portion of his income that was more than $250,000 would be increased from 36 percent to 39 percent. But he also mentioned that his plan includes a 50 percent small-business tax credit for health care and a proposal to eliminate the capital-gains tax for small businesses that increase in value. Obama said his tax plan, which he said focuses on bigger breaks for people making lower incomes, would be good for the economy. "If you've got a plumbing business, you're going to be better off if you've got a whole bunch of customers who can afford to hire you," he said. "Right now, everybody's so pinched that business is bad for everybody. And I think when you spread the wealth around, it's good for everybody." Wurzelbacher said, "The reason I ask you about the American Dream, I mean I've worked hard. I'm a plumber. I work 10, 12 hours a day and I'm buying this company and I'm going to continue working that way. ... I'm getting taxed more and more while fulfilling the American Dream." In an interview with CNN on Thursday, October 16, Wurzelbacher said he had misunderstood Obama's plan and that the company he wants to buy makes well less than $250,000 a year - which Obama says means his taxes would not be increased. Misleading. McCain's remark was an oversimplification of a five-minute-long conversation. Obama replied in great detail about his tax plan, and the "spread the wealth" remark was one small part of the conversation.